Sometimes I get really selfish in my grief. I forget that my kids have lost a sibling. I want to be doted on. I feel I have the right to claim it. I carried her under my heart. I nursed her. I was there. All the time. Even when it got messy. And it did get messy. I forget, however, that the grief isn’t only mine to bear. When I was in my early twenties, I met and married the man who was to become my first two daughters’ dad. I don’t like to think about that time. I was young, selfish and horribly immature. I made HUGE mistakes that I regret. I probably will for the rest of my life. What did come out of this union, however, were two beautiful girls. I don’t believe in divorce. I hate it. But I did it. I initiated it. I have also repented of it. The repercussions of my divorce have come and haunted me again and again. Those scars. Those scars have changed me. I pray, in a good way. Different, regardless. Then God brought this man into my life. Pete. The man who would become my husband. He had something to teach Pete, though too. Pete was in his thirties when I met him. He was living at home. He had no responsibilities. No ties. He had never been married. He had nieces. They were always around but he didn’t seem to invest in them. This was a change, though. Not only was he getting involved with me, I was bringing two little girls into the mix. I am sure that it must have weighed heavily on him. He told me that he felt that he had to make a decision. An even bigger one than most people. He had to decide if he was going to love these little girls that came with their mom. And not only love them but help to raise them, care for them and stand by them, even though they had a father. I don’t know if it was a hard decision. It was a long time ago. It will be 15 years ago next week. But he decided that he was going to love them. And he sealed that promise with a ring. I wonder if he regretted that decision much. We all have days when family life is hard. Really hard. And Arlynne put him, especially, though some terrible times. Times when I could barely hold on. I may have forced him to, but he did. Pete could have run, screaming from our home, but he stayed. He stayed. They made their peace. She developed a love for him that she didn’t seem to have before. She sent him a text that he carried on his phone. She was so thankful that he had married her mom. Pete saved that text for a long time until, one day, it just vanished into cyber-space. Right after she left us. He was with me, at our home, when the policeman arrived. He was standing beside me when we got the news. Pete was the one who grabbed Eden and me and started praying. Right there. In the thick of it. Pete has been a buffer for me. He has shielded me when anything was too much. When I couldn’t deal. He has held me when I cried. He has cried with me. And he has cried himself. I don’t think he would be ashamed to admit it. He has mourned the loss of Arlynne. The hardest part, though, is that somehow someone has gotten the idea that he doesn’t count because he is just the “step-dad”. I know there may be a man out there who don’t treat his wife’s other kids like the treasures they are. He doesn’t accept them. He doesn’t sacrifice for them. But that isn’t Pete. 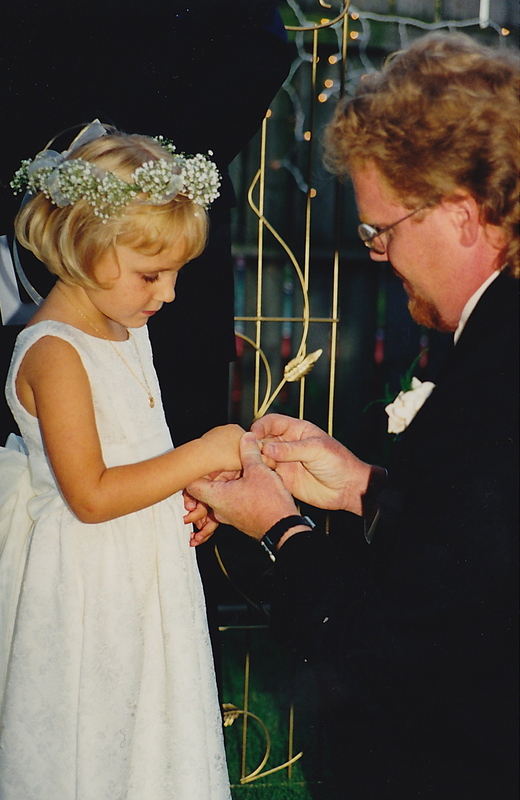 He knew that one day these little girls would grow up and another man might walk them down the aisle. They might stand up and give their “real” dad the credit for who they turned out to be. I am not denying their dad his thanks. He has been there. What hurts me, though, is the feeling from a number of people that Pete’s grief doesn’t count. It does. He does. I think Arlynne’s death has affected Pete just as much as the death of one of his kids would have. Maybe even more so. He has known the four youngest children almost since the moment they were conceived but he didn’t “choose” them. He chose Karissa and Arlynne. He chose them when he chose me. He and I have had rough times during our relationship. Sometimes it seems like we shouldn’t be here still, together. But God has been faithful. God has poured His grace into our home and I am forever grateful. Pete has changed me. He has shown me how much he can accept two little girls that weren’t even his own. He has shown me how to walk by faith, even when it seems impossible. He has always believed in me, always encouraged me, and always supported me. He has shown me that everyone sins and yet God keeps right on loving us. Pete told me tonight that he will keep on loving me, just like that. I don’t deserve it. I don’t appreciate it like I should. But I am incredibly grateful for that too.